Do you recognize this princess? I hope you do! The whole project was a lot of fun, from choosing the size and color of papers to deciding on the hairstyle. 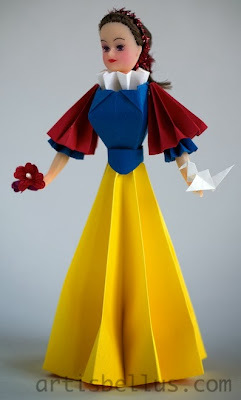 I created the Snow White doll with traditional kusudama pieces and bell flower pieces. 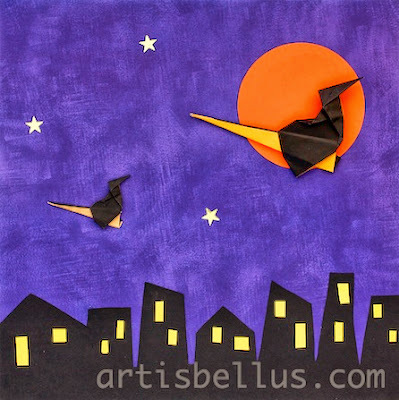 I was inspired by the paper dolls from the book Creating Lovely Paper-Flower Dolls . 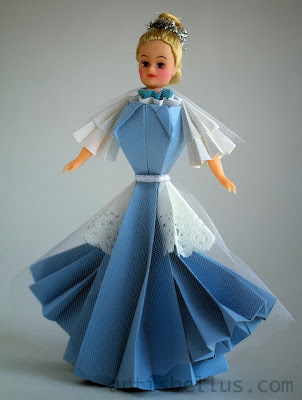 The skirt is folded with a 10" (250 mm) square of yellow construction paper, the bodice is folded with a 4" (100) square of blue tant paper, the collar is folded with a 3" (75mm) square of white washi paper, and each sleeve is folded with a 3" (75 mm) square of red construction paper and a 2" (50 mm) square of blue tant paper. 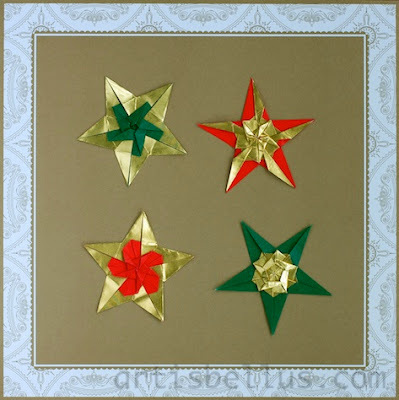 Stars are very popular decorations for Christmas Trees. These ones are already decorating mine! 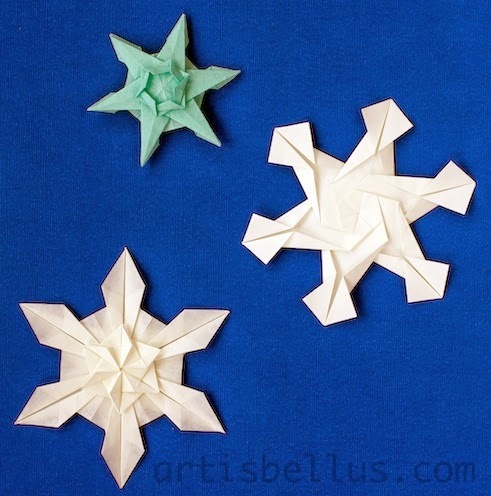 The stars were designed by Tomoko Fuse. The instructions to fold them can be found in her book, Origami Stars and Snowflakes, ISBN 9784416309148. 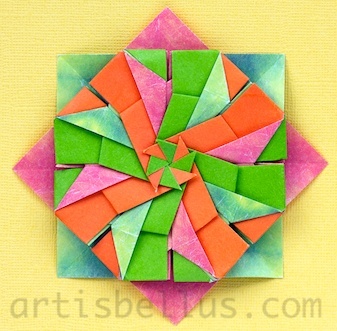 Each star is folded with a pentagon, that I cut from 6" (150 mm) square of double-sided origami paper. 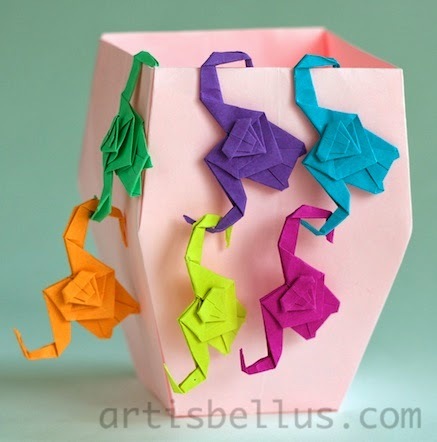 These origami monkeys are so much fun! The origami monkeys were created by Tomoko Fuse. The instructions to fold them can be found in her book Origami Gifts . The vase was created by Saburo Kase. 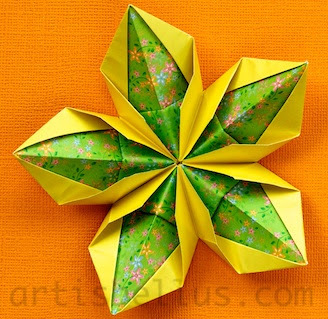 The instructions to fold it can be found in the book Origami: Paperfolding for Fun , by Eric Kenneway. I folded the monkeys with 4" (100 mm) squares of Folia paper, and the vase with a 12" (300 mm) square of construction paper. 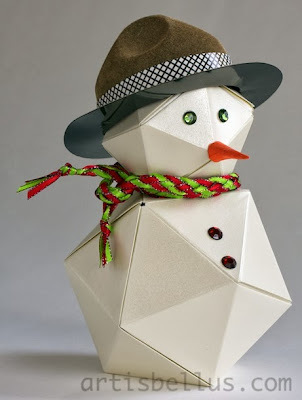 I made the snowman with two modular icosahedrons, and then added some decorations. The modulars were created by Tomoko Fuse, and the instructions to fold them can be found in page 78 of her book Unit Origami Essence . I used Wausau Paper Metallics, champagne pearl color, which comes in letter size. It's thicker than copy paper and folds nicely, which worked very well for this modular. I cut five 8 ½" (216 mm) squares for the body and five 5 ½" (140 mm) squares for the head. 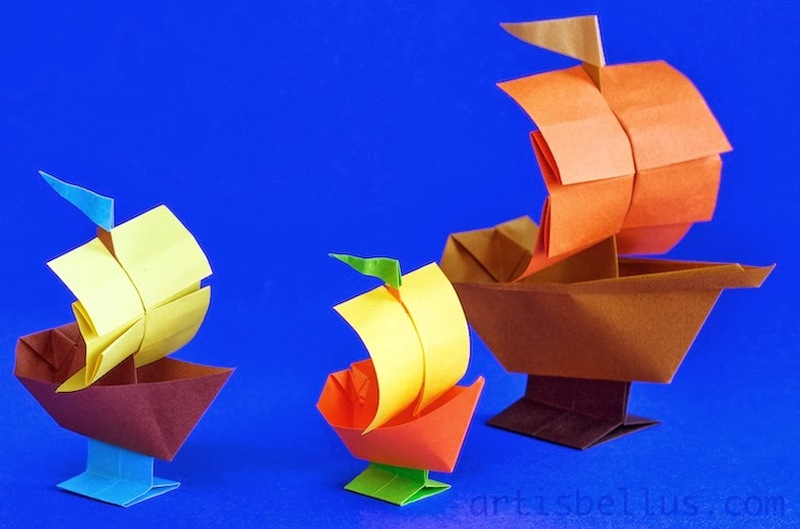 These toy boats are so fun to fold that I promise you will not be able to fold just one, you'll keep going till you have your own fleet! The Toy Boats were designed by Yuri and Katrin Shumakov. The instructions can be found in their ebook Origami Toy Boats. Each boat is folded with four sheets of paper: one square for the boat, one half square for the stand, another square or half square for the sail (depending on the model you choose), and a smaller square for the flag. For the boats in the picture I used squares that range from 3" (75 mm) to 6" (150 mm). I folded each one of them with a different type of paper, from left to right: Folia paper squares, copy paper, and Tant paper. This full-rigged ship is a beautiful and clever model, designed by Patricia Crawford. It's a nice decoration for a kids room. 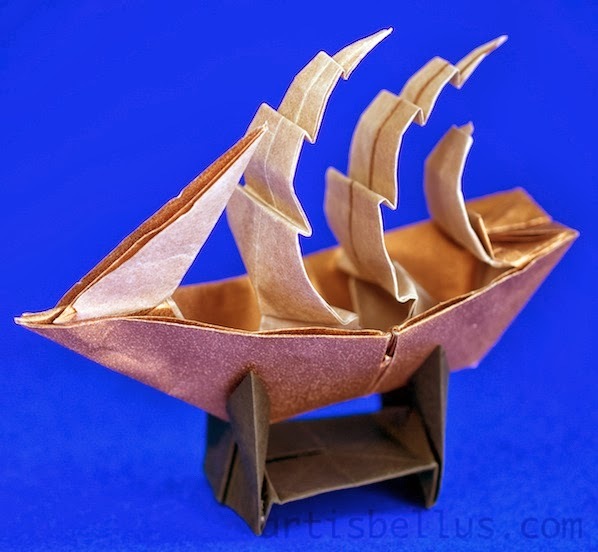 The instructions to fold the full-rigged ship, including the stand, can be found in the book Origami: Step by Step , by Robert Harbin. I folded the ship with a 12" (300 mm) square of tissue-foil paper, and the stand with a 4" (100 mm) square of elephant hide paper. 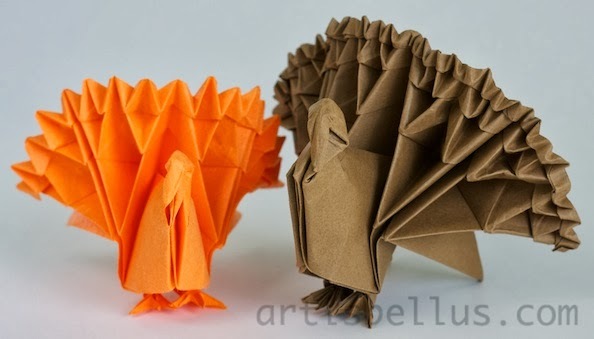 The cat is an elegant origami model designed by Tomoko Fuse. 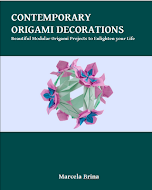 The diagrams can be found in her book Simple Traditional Origami . I folded the cat with a 6" (150 mm) square of black origami paper. "When witches go riding, and black cats are seen, the moon laughs and whispers, ‘tis near Halloween". 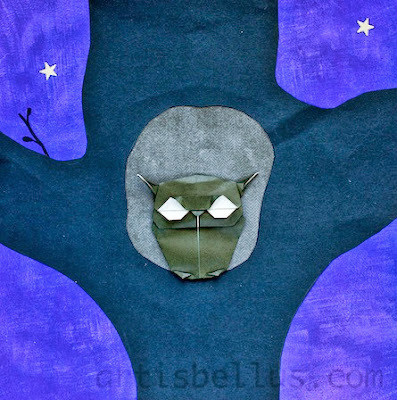 The "Witch on a Broomstick" is a fun origami model designed by Paul Jackson. 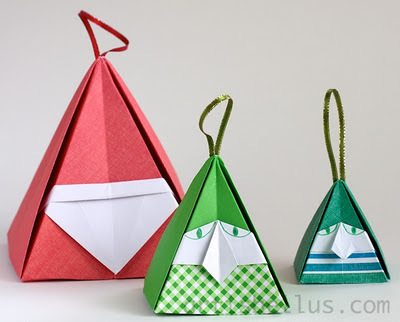 The diagrams can be found in his book Festive Folding: Decorative Origami for Parties and Celebrations . 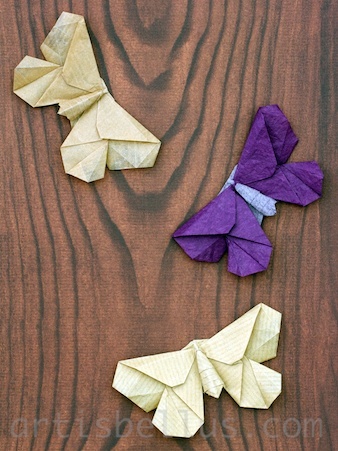 I folded the witches with 3" (75 mm) and 6" (150 mm) squares of double-sided origami paper. 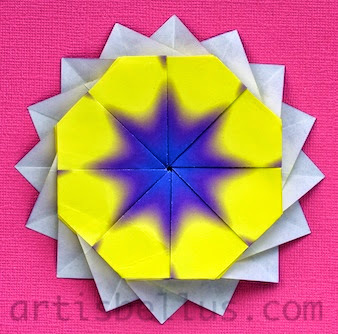 This is another modular flower designed by Tomoko Fuse. This model is very interesting, as it has an extra piece attached to the back to make it sturdy, which also makes it very beautiful from both sides. 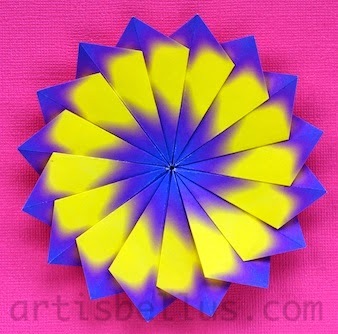 I folded the flower with eight 3" (75 mm) squares of double-sided patterned origami paper. 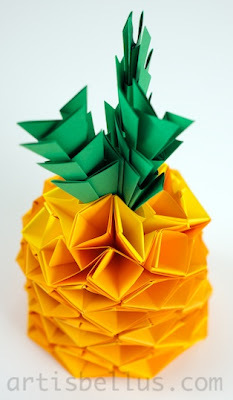 I was recently asked, in one of the Origami Houston meetings, about ideas for place card holders for a party. 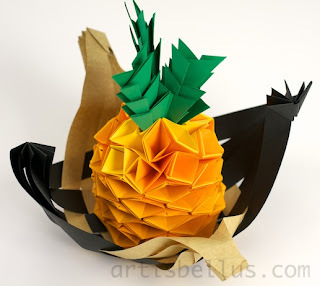 They needed to be simple, elegant, and not too much time consuming, as the host would have to fold a bunch of them by himself. 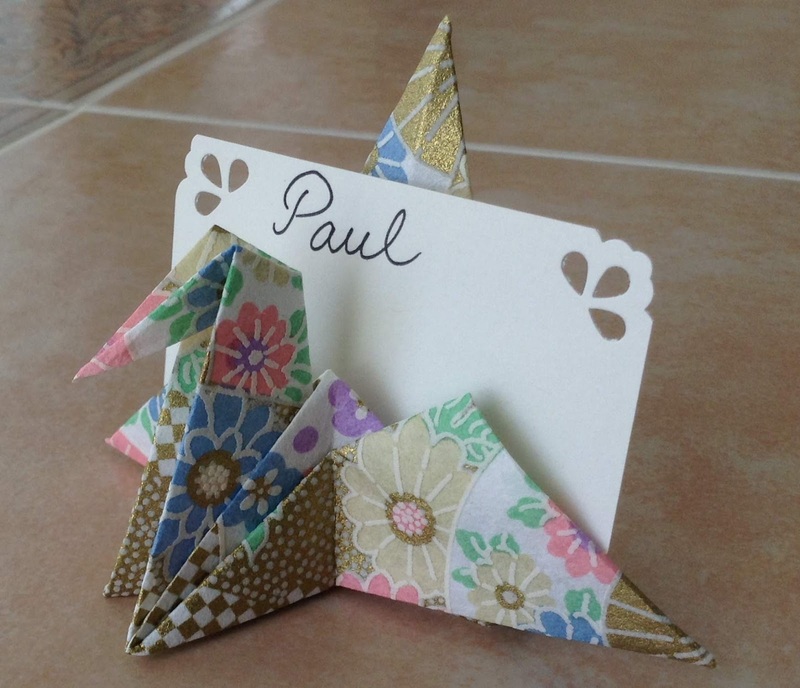 I suggested to go with this one, the traditional crane place card holder. 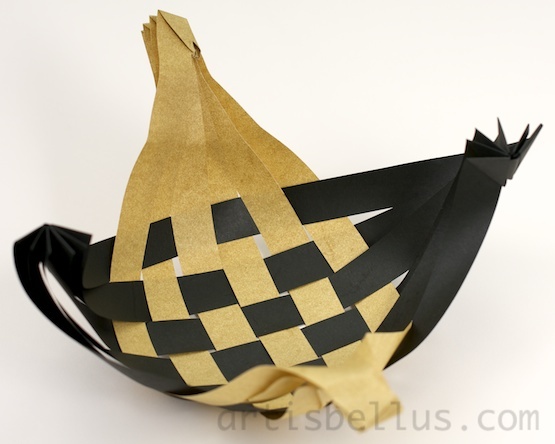 The crane place card holder is a modification of the traditional flapping bird. 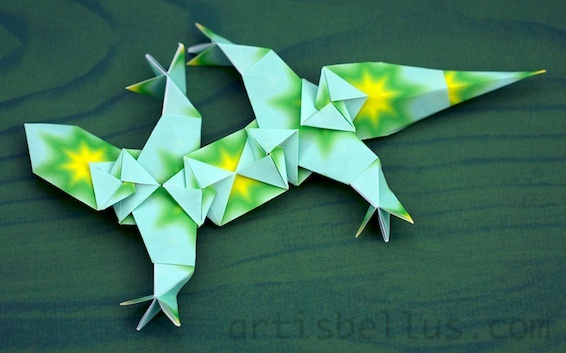 The instructions can be found in the book Crane Origami . 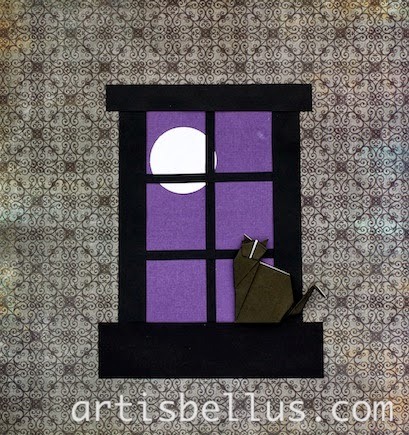 I folded the model in the picture above with a 6" (150 mm) square of embossed washi paper, and added a 3" x 1½" (75 mm x 38 mm) name card, decorated with a scrapbooking corner punch. The place card holders can have an elegant or casual look depending on the paper you choose. From left to right: embossed origami paper, elephant hide paper, scrapbook paper, tant paper, patterned origami paper. This cute little mouse just found a plate full of cheddar cheese, and it's ready to eat it all! Mouse, created by Eduardo Clemente, folded for a 6" (150 mm) square of parchment paper. 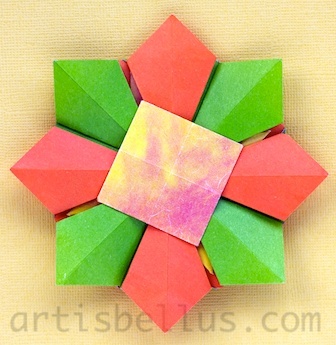 The instructions can be found in the book Origami : 30 fold-by-fold projects . 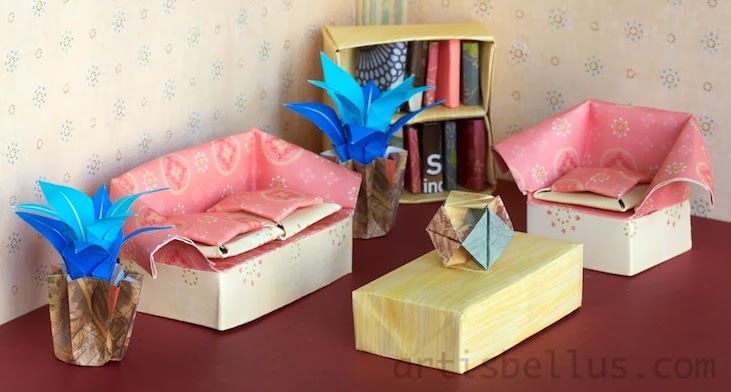 Boxes (resembling cheese), created by Tomoko Fuse, folded from 3", 4", and 6" (75, 100 and 150 mm) squares of copy paper and tant paper. The instructions can be found in the book, 12 Months in a Small Box - Autumn Winter, ISBN 4480873406.